One of the keys in fostering a collaborative culture has been the vision of Stronger Together, which is our coming together as churches to effectively reach the fifteen million people of our region for Christ. Now that we’re praying, networking, and sharing resources in church planting, church health, and leadership development, we’re experiencing amplified kingdom impact in our movement. For example, we praise God that in the past five years we’ve launched 35 church plants, provided 50 Guided Ministry Internships for students, trained 62 women in comprehensive discipleship, provided countless equipping events and consultations, and helped organize youth events attended by up to 2,500 teens, with many professions of faith. We praise God too that donations from our churches have grown dramatically – from $170,900 five years ago (112 churches) to $512,000 (161 churches) at the end of 2015. We could not have accomplished this without the Lord and, we could not have accomplished this alone. We are stronger together when we work together. The theme of our 2016 convention was “From Dream to Action”. This was my first conference since beginning my role as AÉBÉQ’s Regional Director. This conference was carefully prepared by a wonderful support team. Two years ago we adopted the new Vision 2020 Strategic Plan. We use every opportunity to communicate the vision and encourage our churches with it. As we continue to incorporate this vision into all we do as a Fellowship Region, there has been a unanimous feeling of synchronized action and direction. Quebec is the largest missionary field in the northern hemisphere. There is a tremendous and increasing need for the Word of God. While we would like to be able to report that we are winning this territory for Christ, we are encountering hardened hearts, and there is a significant battle for the souls of the lost. Despite this reality, our faith grows and we increasingly put our trust in God to move hearts to bring about change. This is why we dream — we believe that God is infinitely more powerful than the enemy. This is why we incorporate, as part of our vision, the bold prayer made by our forefathers 60 years ago: “May God send His divine rain on the Quebec region”. Thank you for keeping us in your prayers before the throne of Grace. Our recent annual conference, “The Regional”, was hosted by our Lake Echo congregation. Our leaders’ forum was encouraging and thought-provoking as three of our leaders described their ministry blessings and mission strategies as it relates to discipleship, as well as some of the challenges they are facing in their unique communities. Our theme was “Disciple Dynamics”, with messages related to the practical requirements of the discipleship processes. Approximately 75% of our congregations were represented, including our three church plants. The updates from these plants are encouraging – they talked of consistent fruit and the need to expand meeting spaces. Our total number of congregations is now 20. A new congregation was voted into the Region: Parker’s Cove Baptist Church, which is located in the lower valley region of Nova Scotia. They are currently in search of a lead pastor. Our bi-vocational Regional Director is beginning to transition away from his role due to a change in geography with his other work. This transition will continue until a replacement is named. At Impact 2016, Fellowship Pacific overwhelmingly passed a motion to continue indefinitely in the direction of our pilot project, Partnership 2016. The vote was the culmination of five years of seeking to transform our culture from one of fierce independence to one of voluntary and joyful interdependence. While a lot of work was required as this historic vote approached, the reality is that the decision was quite straightforward. The past five years have proven that a choice to work together brings great Kingdom results, including financial stability, church plants, church growth, and an increasing enjoyment in serving together. Thank God for this important decision! The shift from independence to interdependence is seismic – the earth rumbling within our Region. With independence, things can be requested of us. Without servanthood, we say, “they can’t make me”. With interdependence, things can be required of us. This, of course, requires a servant’s heart. Then we’re able to say, “I allow others to make me better”. Our “Interdependence Excellence” document helps us contemplate our heart’s condition. Updates from Fellowship pastors sharing how church consultations have impacted the ministry of their churches. In the Fall of 2008, Ladysmith Fellowship Baptist Church in the town of Ladysmith on Vancouver Island had a consultation team come to assess the church. The team was composed of Regional Director, David Horita, BC Fellowship Stewardship Director, Doug Fordham, BC Fellowship President, Lorie Wasyliw and longtime Fellowship Pastor, Gordon Reeve. This was a crucial step in the life of the church. The team pointed out that this church was not relevant to its community, and was not reaching people for Christ in any kind of significant way. They provided effective recommendations that ranged from practical outreach suggestions, to physical building updates, to a possible name change, to what the church should be looking for in its next Lead Pastor. I was hired as Lead Pastor and began my ministry in 2010. The consultation set the stage for the avalanche of changes through which God inspired me to lead the church. Without a consultation having been done prior to my arrival, the majority of the people in the church would not have seen the need to change, nor would they have begun to think about positive steps to take going forward. As I write this in September 2015, I am extremely grateful for the important role the consultation team performed in paving the way for the process of church revitalization. Today this local church is known as Oceanview Community Church. We are known for being a dynamic force for serving in the town of Ladysmith. We are known for consistent preaching of the Gospel that results in people proclaiming their conversion stories when they stand in the waters of baptism. We are known for being a place that prizes, blesses, and teaches, kids and teens. One of the most aggravating experiences happen when you feel like you’re doing a lot of things right and yet you’re not getting the results you would expect. That’s how I was feeling as we came into 2011. I remember saying to our Regional Director Dave Horita and our consultation team, “Tell us whatever we need to hear. Don’t spare our feelings—tell us straight.” Not only did they do that, they did it in the spirit of kindness, prayer and wisdom. These three statements find their way into our objectives, ongoing ministry strategy, literature, webpage, graphics (thanks to a very talented intern on our staff! ), sermons, and prayers. I would say that this, together with other recommendations from our consultation team, has breathed new life and passion into me, our leadership, and the people of Sardis Fellowship. Yes, a consultation requires diligence, determination, stick-to-itiveness and a spirit of humility (being critiqued is never fun). Yet fruitfulness, as people come to faith and fresh growth is seen in the church (we are now undertaking a much-needed building expansion), makes it truly worthwhile. We look forward to experiencing what it means to be centred in Christ, visible in community, transforming our world. Perhaps one of the great challenges for any church is how to embrace change; to avoid what I call arrival syndrome. Arrival Syndrome is when the church loses its desire to reach the lost and succumbs to being comfortable with the status quo. In 2 Corinthians 13:5 we are urged to “examine” ourselves. Are we intentionally “living” the Gospel Message of Jesus Christ? I believe the examination process helps us answer this crucial question. One way of approaching the “process of examining” is through a church-wide consultation. In January of 2015, under the guidance of Glenn Goode, our Regional Director, and a team of Fellowship Atlantic pastors, Lake Echo Fellowship Baptist Church began the journey of examining. Needless to say, there was some trepidation. What would we discover? In spite of our fears, we committed ourselves to this time of reflection. With continual prayer for wisdom, we joined together with the consultation team to examine every aspect of our church life. Transparency was key. This included a church-wide survey, focus groups, and interviews with key leaders and pastoral staff, to name a few. All aspects of the consultation process proved to be tremendously beneficial. It allowed everyone to gain a broader perspective of our mission as a church. How do we see ourselves and how might we change to be more effective? In the end, we believe the consultation provided our church with important information. It affirmed and encouraged those practices we were doing well, but also outlined areas that were out of alignment with the mission of the church. How do we ensure our health and vibrancy as a church? Every church should seriously consider the benefits of a consultation. In the Fall of 2012, the church board of elders, the deacons and the pastor were wrestling with the question; “What do we need to do to see Parkdale’s Sunday morning attendance grow?” Parkdale was in its 56th year in the small city of Belleville. It was, in many respects, a healthy church with a strong missional aspect to its ministry. Yet, as leaders, we felt deeply that we needed direction from God as to our next steps. I mentioned to the board that I had heard at Fellowship National Conference that FEB Central was willing to come into a local church and provide a consultation as part of their emphasis on Church Health. The board asked me to contact FEB Central. I did, and we ended up going through a process that blessed Parkdale in many ways, and continues to bless us as we use the written prescriptions to guide our yearly plans. Honestly I was a little timid about having FEB Central examine our church through a church-wide survey, and interviews with key members as well as associate staff, especially when I found out that the two men coming to examine us were Regional Director Bob Flemming, and “Bishop” Jack Hannah. But the entire process was really beneficial and a blessing. The board chairs and myself were given an opportunity to hear and give feedback on their report BEFORE they took it to the congregation in a town hall meeting. Honest conversation with men who love the Lord, love His church, and love His pastors, and have spent their lives in church does a world of good! • Create a vision, mission, and values statement. • Develop organizational systems that will allow newcomers to be assimilated into the church. • Complete the web site renovation to help improve communication and help bring cohesion to the overall ministry of Parkdale. • Explore further avenues of communication; leadership and congregation and vice-versa. • Recruit and train more volunteers. • Celebrate what the Lord is doing, continue to believe Him for even greater heights of effectiveness. Seems pretty basic, and yet the details are what helps us as a church keep moving in a straight line. We haven’t seen a massive influx of people, though Parkdale is continuing to grow and we are in the midst of a tremendous harvest of young souls in an unchurched neighbourhood. Church Consultation, and the emphasis of FEB Central on helping churches stay focused on health, has borne fruit in Belleville, Ontario. Toronto is North America’s fourth largest city and as the city grows, the Gospel’s influence is diminishing. As a region, FEB Central has been relatively effective at planting suburban churches, but has made few inroads into the urban core. It is our dream to leverage the strengths of the almost 50 Fellowship churches in the city of Toronto for a new urban church planter training initiative. The Advance Church Planter Training Institute is being developed to equip a cohort of church planters who love the city to reach the city. It involves a two-year residency during which each planter will learn critical competencies of urban church planting. The cohort will develop a ministry plan, a support base, a launch team and will initiate a new church upon completion of the program. Please be in prayer for Tom Haines and Darryl Dash as they work on the development of the Advance Institute. Eastern Quebec Regional Project: Pioneer Missionaries Required! The Fellowship French Region has determined that in order to put the Gospel within reach of every francophone in the province, there are two specific regions that still require a strategic pioneer missionary approach: the Abitibi region, where the francophone expression of our Fellowship first began in northern Quebec; and what we are calling Eastern Quebec (the lower St Lawrence, the North Shore, and the Gaspé). In this vast latter region, there are only nine small struggling Fellowship churches and an evangelical population of 0.3%, similar to that of the island of Montreal. We estimate a need for 15 to 20 new workers not just to sustain but also to develop this region. We are looking for partners who will support this regional effort. Every day we pray that God would send us new workers and He is doing just that. In recent months, God has put us in contact with cross-cultural missionaries from English Canada, the USA, France and Brazil, all sensing God’s call to Quebec. Two Brazilian couples are helping Richard and Janice Houle in the Montreal borough of LaSalle. Another English Canadian couple is currently raising support in order to move to Rivière-du-Loup and participate in the Eastern Quebec project. They will take two years to acculturate and learn the language. This couple actually discovered us via the internet! This year marks eight years since we planted PAXnorth Church in the high risk community of Halifax’s northend. We have committed mistakes and in many ways are still stumbling through the work of putting into place a full expression of a Biblical ecclesia. Still, with almost 40% of our congregation having come to Christ through life-on-life, gospel-centered relationships, we are thankful for what God’s Spirit is doing in reproducing disciples in our midst. Admittedly, this life-on-life discipleship model of reproducing church is highly inefficient on many levels. Yet the labour and sacrifice of life lived out with other broken pilgrims is making a difference in our church. PAXnorth doesn’t have it all together. We are not yet self-sustaining. We still have to figure out how to best see disciples move from evangelism to membership and how to best reproduce deacons and elders. Planting a second church is stretching us beyond our capacities. But we have already begun to see new people come to Christ and grow in their commitment to the church’s mission both at Grace Village Church and PAXnorth Church as a direct result of following through with our commitment to be a reproducing church. We encourage you to pray for PAXnorth and Grace Village Church as we courageously serve and make more disciples of Jesus in Nova Scotia and Atlantic Canada. One of the primary responsibilities of all five Fellowship Regions is to help local churches plant new churches. This Fall, Fellowship National is seeking to support our Regions and churches in this critical ministry by subsidizing the attendance of many of our Fellowship church planters to the Canadian CPC Conference. Close to 40 Fellowship church planters from across the country will be attending the upcoming CPC (Church Planting Conference) in Montreal. The conference is called “MOMENTUM” and its purpose is to create a learning environment for all aspects of church planting across our nation. Church planters, church leaders, academics and researchers gather every two years to listen, dialogue and report on what God is doing in Canada in the area of church planting. This year’s speaker is Dr. Ed. Stetzer. He will present new research on how to continue to think through our Canadian mission field. The Fellowship has planted 40 churches over the past five years. But there is still much more to be done. 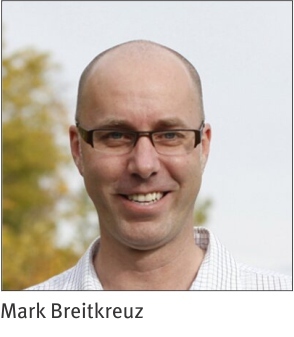 The Leadership Board of Fellowship Prairies is pleased to announce that Mark Breitkreuz has been appointed Regional Director, effective January 1, 2015. Mark’s gifting and passion together with twenty years of pastoral experience in a variety of roles has prepared him well for this new responsibility. His experience includes pastoral roles in three churches, the last twelve years as Associate Pastor at First Baptist Church in Lloydminster, Saskatchewan. 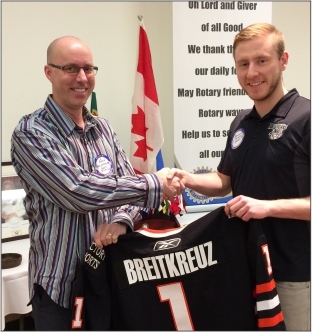 In the community he has served as Chaplain to the Lloydminster Bobcats AJHL hockey team since 2007. At the regional level he has been part of various Church Consultation Teams with varying involvement from team member to team leader. Since 2004 he has been part of Fellowship Prairies Advisory Ministry where he has been Chair from 2005 to the present. Mark has been married to Andrea for twenty years; they have two teen-age children, Natalia and Ethan. Andrea is an elementary school teacher. We look forward to what God has in store for the Region under his leadership. —David Thompson, Leadership Board Chair, Fellowship Prairies Inc.
Fellowship Pacific— For the first decade of my life, I was in a single parent home in Montreal, Quebec. My mother had been widowed at a young age, and was left with four children under the age of three. However, she did a wonderful job of maintaining a family focus on Christ, with daily family devotions and prayer. It was during one of those family devotion times that I became clear on the reality of Christ's sacrifice on my behalf, such that I accepted Christ as my personal Saviour right then, with my family around me. Not long after, my mother remarried to a wonderful Christian man who quickly became, in all aspects, my father. The family moved to Victoria, B.C., and most of my teenage years were spent at Central Baptist Church. Between my mother and father, and the excellent youth programs of Central, I was privileged to have supportive, energetic, and intentional disciplers concerned about my growth in Christ. Most schooling and other experiences are merely a carry-forward of the good work done by others in the early years of my life. Fellowship Prairies — Born into a Christian home, I became a Christian at the age of five. The passing of my great-grandmother “made the dots connect” for me. That circumstance caused me to process all I’d been taught, and personalize a decision to follow Christ. I was baptized at the age of twelve, and knew of the Lord’s leading in my life to pursue full-time ministry. And while my journey has not been perfect (After all, I’m a part of the journey), it has come with no regrets, or major setbacks. By His grace, I’m His and He is mine. AÉBÉQ — In 1972, at age 19, during my second year of college, I heard of the Gospel through a classmate who had been invited to a Bible study. She was enthusiastic and wanted to return but when the time came, she decided not to go. Despite feeling uncomfortable, I decided to go alone. I was a sceptic and distrustful of religious sects. I listened carefully to the preaching and songs in order to find potential doctrinal errors. But because people were engaging and nice to me, I went back. I asked many questions (not always with good motives), read the New Testament and attended two Evangelical churches (a Brethren church and a Baptist church). During this period of listening and researching potential false doctrines, I finally understood that my sins were leading me to eternal perdition. I was looking for the error that was indoctrinating these people, but God made me understand that I was proud, blind and lost. The search for error led me to understand the truth. After three months of research reading the Gospel of Luke, I finally understood that faith did not need to be discussed, but simply exercised, as a small child would exercise it (Luke 18:17). I realized that salvation is obtained by simple faith without works. I just had to believe in the sacrifice of Jesus on the cross, as would a small child, without doubting or questioning it. Then, alone in my room, I accepted Jesus as my personal Saviour and Lord of my life and repented of my sins. I then attended the Roberval, Lac St-Jean Evangelical Baptist Church, which had been newly started by Pastor Gabriel Cotnoir. Three months later, I confessed Jesus through baptism by immersion. This girl who had been invited to a Bible study and who had awakened my curiosity, never became a believer despite my efforts in testifying to her. In His grace, even with no believers around me, God used her to stimulate my curiosity, direct me towards Christians who loved me and presented me with Jesus. God is great and powerful when he wants to go find a lost sheep.